This little wood box is truly a wonder. The lid fits so neatly that it's virtually invisible when closed. 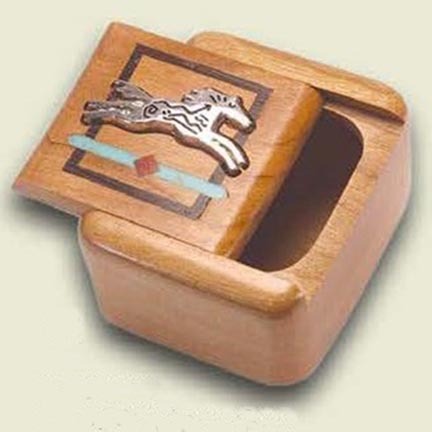 Contrasting wood & turquoise is inlaid on the top, and embellished with a polished silver horse. A sweet little jewelry box, or keepsake holder - maybe a lock of mane? Made in the USA of sustainably harvested African Padauk wood. About 2" x 1 1/2". Inside opening is about 1" deep.